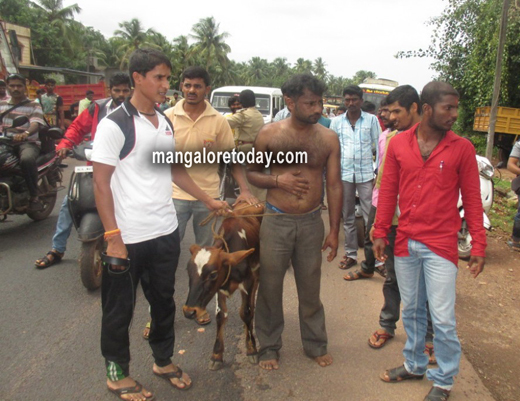 Bhatkal, August 4, 2016: Suspected members of saffron organisations thrashed a person alleging that he stole a calf with the intention of selling it to Muslims. After beating him up, the activist took out a procession from Chowtani towards the town Police station passing through National Highway 66, heroically parading their achievement in apprehending the alleged thief. The accused has been identified as Shekhar Manjayya Naik (24), from Puravarga. The police intervened at the Raghvendra Mutt and rescued the accused. CPI Suresh Nayak, PSI Revathi and PSI Kudagunti tried to pacify the activists. But the activists did not listen to the police initially. Subsequently the police managed to take Shekhar from them and was taken to the town police station. It is said that Shekhar was transporting a calf on Wednesday morning, when Hindu activists stopped the vehicle and pulled him out. Then they stripped off his shirt and thrashed him even with belts. According to the sources, the calf belongs to Moosa Jabali from Purvarga who has submitted his proof of ownership to the police. Surprisingly police filed a case against Shekhar for stealing the calf, but no case has been filed against the attackers who took the law into their hands.